Aisyah, Siti (2001) Hubungan antara pelaksanaan peran ibu dengan kemampuan penyesuaian diri anak usia prasekolah (Studi kasus pada TK Mutiara Indonesia). Skripsi thesis, Universitas Tarumanagara. "Children are potential resources for the development of the future generation. The development of children is associated with parents” role, primarily mother's role since mother is the significant person where a child obtains love, care and, attention. Pre-school age is the age of 3 to 6 years old. Developmental theories assume that the range of 3-6 years of age is the most critical period in the developmental process of a child. Children's interactive experience with their parents during this age will determine their behavior in the society in their later evelopment. This research is aimed at finding the relationship between the implementation of mother's role and the adjustment capacity of pre-school children. The participants were 30 mothers whose children were registered as tudents in Mutiara Indonesia kindegarten in Tanjung Duren and Taman Surya in 7 West Jakarta area. This research utilized questionnaires for data collection, and SPSS for windows release 10.0 was utilized to measure their responses. 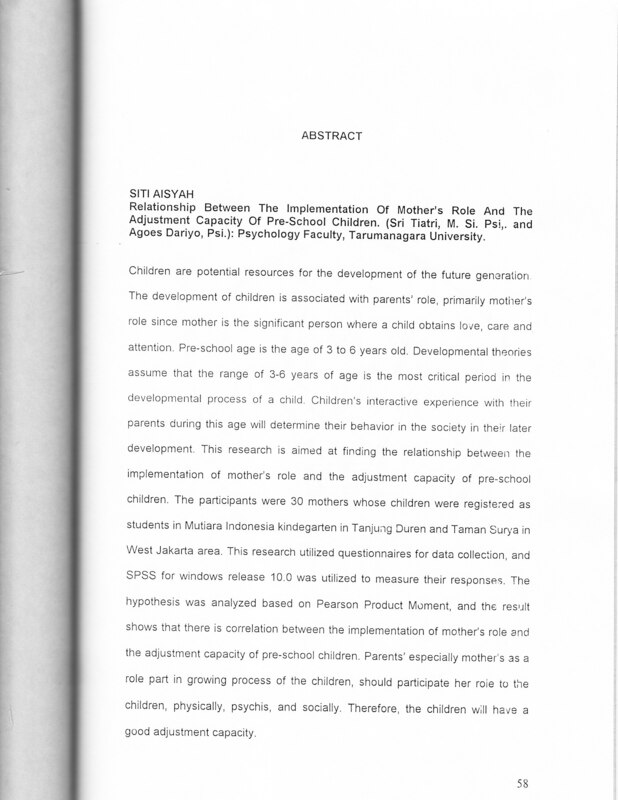 The 1 hypothesis was analyzed based on Pearson Product Moment, and the result shows that there is correlation between the implementation of mother's role and the adjustment capacity of pre-school children. Parents” especially mother's as a role part in growing process of the children, should participate her role to the children, physically, psychis, and socially. Therefore, the children will have a good adjustment capacity."